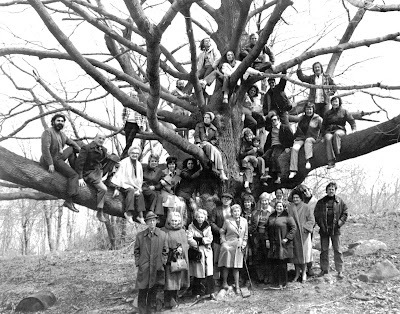 This remarkable photograph was taken in 1974 to mark the founding of the new Ridgefield Guild of Artists, whose members gathered in and about this huge oak on the grounds of the old Holy Ghost Novitiate on Prospect Ridge. The guild had just gotten a $1-a-year lease for a small, old barn on the grounds that had been purchased by the town four years earlier. The artists renovated the building into their headquarters and gallery, still in use today. Their first show in the barn opened Memorial Day weekend, 1974. Like the guild, that wonderful tree is also still alive and well near the building, which is at the end of Halpin Lane off Prospect Ridge Road. The trouble is: We have no record of who took the picture and the identification of many of the people in the picture had not been found. Thanks to the folks at the guild, we were able to obtain the accompanying copy of the picture, with the names of some of the artists overlaid on it. 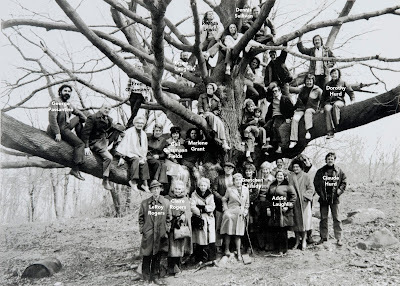 Those identifications were provided some years ago by the late Gail Rogers Glissmann Fields, who herself appears in the photo. More than half the faces remain unidentified? Can anyone help fill in the artistic blanks?